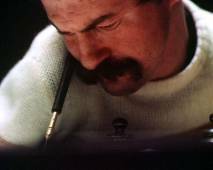 The film is a portrait of Jerzy Orłowski, an armless graphic artist. Impressionistic scenes present the protagonist in various situations: when he has to deal with everyday chores, when he jumps into water, skis and draws. Even the simplest activity requires struggle, resilience and outstanding fitness from him. Many takes are in slow motion, contemplating the smallest detail, which the director is so skilfully able to bring out. Documentary film director, cinematographer, photographer and university teacher born in 1941 in Lodz. A graduate of Lodz Film School (1965). An Ordinary Professor of Film and Photography and the Dean of the Radio and Television Department of the Silesia University in Katowice. He has received a number of prestigious awards for his excellent documentary films, which focus primarily on arts or sports and include "Krzyz i Topor", "Hokej", "Olimpiada", "Kilka opowiesci o czlowieku" at festivals in Bilbao, Brussels, Leipzig, Marseilles, Oberhausen, San Sebastian and Krakow, among others.